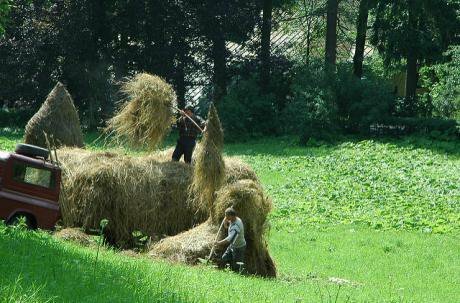 Romanian farm craft.Wikicommons/pragmatopian.Some rights reserved.Industrial agriculture and its discontents have been in the headlines more than usual as World Food Day rolls around. Over $100bn looks set to be spent as Monsanto and Syngenta are bought out by Bayer and ChemChina, while Dow and DuPont intend to merge in a deal reportedly worth $130bn. What this means away from the business pages is that the agribusiness stranglehold on our food supply is going from bad to worse. At the start of the 2016, six companies controlled 59% of the world’s seed supply, and 64% of the global pesticide market. Nine months on, three mergers later, and the outlook is even bleaker: three mega-corporations could control these huge swathes of the farming system in the coming months. These deals have already faced huge backlash, with dire warnings that they would price small-scale farmers out of the market – particularly in the global South – and force genetically modified crops onto a resistant EU public. This much is true. But the system is already broken, and has been for some time. The agreements rubber-stamp a long-term trend that is driving smallholders from our fields and consolidating them into large, destructive, chemical-dependent farms, beholden to corporate interests. The evidence that industrial farming is cutting off the branch it sits on isn’t new: 70% of the world’s fresh water is used by the thirsty industrial agriculture system, and the impacts on nature are stark – one third of Europe’s farmland bird species are now threatened or near threatened, and 39% are still declining. One third of Europe’s farmland bird species are now threatened or near threatened, and 39% are still declining. Meanwhile the climate impacts are huge. Livestock agriculture alone contributes more to climate change than aviation, cars and trains combined, and the industrial farming sector as a whole is responsible for at least 30% of greenhouse gases. On the other hand, weaning ourselves off industrial farming could sequester up to 40% of global carbon dioxide emissions. Fossil fuels must be kept in the ground, but we need to make sure small-scale farmers remain on top of it. While small-scale farmers continued to be pushed out at an alarming rate – in Romania, three small farms disappear every hour and three million farms have been lost in Europe in the last eight years – a remarkable people-powered revolution happening in the fields is providing a counter-narrative to the consolidation of global agribusiness. Community-supported farm projects are going from strength to strength, cities are drawing up local food economy plans, farmers’ markets are breaking into former food deserts and traditional varieties of fruits and vegetables are becoming increasingly popular. This burgeoning grassroots movement is not only putting food on plates, it is also getting organised and political. In the Netherlands one of the biggest ever civil society tribunals is this weekend investigating the eco-crimes of Monsanto. Meanwhile in Romania, this month will see one of the largest-ever European meetings of people of all walks of rural life working to wrest back control of the food system. On the menu at the Nyéléni forum for food sovereignty: how to localise food production, improve incomes and conditions for farm workers, take on the mega-mergers and build a movement to challenge the political elite to radically change the EU’s disastrous Common Agriculture Policy. Their central goal is food sovereignty – simply put, the right of people to define their own food and agriculture systems and policies. With climate change breathing down our necks there is an urgent need to transform our food system into one that is more future-proof. A farming landscape and food system build on diversity, resilience and equity is the only way forward for both nature and people. A world away from what agribusiness mega-mergers would lock in, but one we can’t afford not to fight for.